Techie Mum: Did you know Facebook has a secret inbox? 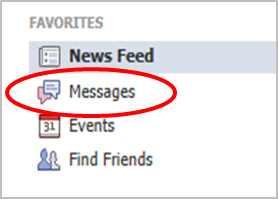 Did you know Facebook has a secret inbox? Email and messages from friends and their friends go directly to your main Messages inbox. You access these messages from your home page. However, what if someone who is not your ‘friend’ sends you a message? Maybe someone from school trying to organise a reunion, or trying to find out if you're the long-lost heir to a fortune? Those messages will go to your hidden Other inbox within your messages. Your Other inbox contains messages sent from pages you ‘like’ on Facebook, mailing lists and broad distribution groups, along with messages from people who aren’t friends or friends of friends. It’s not exactly hidden, but it’s usually ignored. You don’t see it until you click on Messages, and if you’ve gone straight to reading your messages, it’s likely you won’t notice that the word ‘Other’ has appeared. To view the messages in your Other inbox – just click on Other. If you reply to a message from the Other inbox, it will automatically be moved into your main inbox, along with any subsequent messages from that person. At a Facebook class I taught last week, no one had noticed that the Other inbox was there and most had some messages waiting for them. You might find this hidden inbox also explains why you haven't received a reply to a message you've sent to someone who wasn't your Facebook 'friend' - they may not know about the Other inbox either! Now that you know it’s there, you just need to remind yourself to check it occasionally so you don’t miss what could be something important.